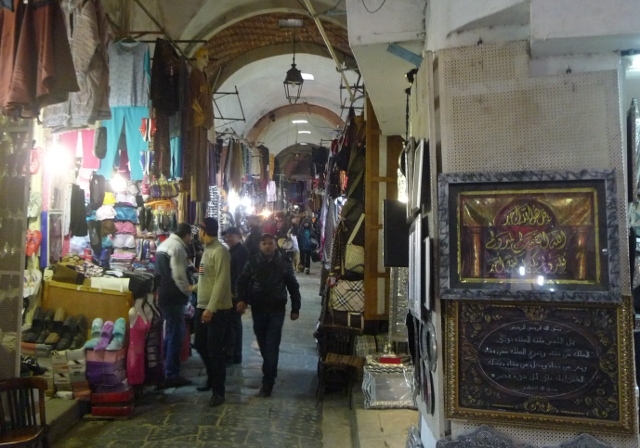 Tunis’ Medina spreads for a considerable distance in every direction – before the French colonisation, it was the entire town centre. The French new town spreads around it in a lovely regular grid pattern, but the Medina itself has nothing whatsoever to do with such boring predictability. Oh, no. Just little alleyways heading off in seemingly random directions, jinking left and right as they twist and wind. 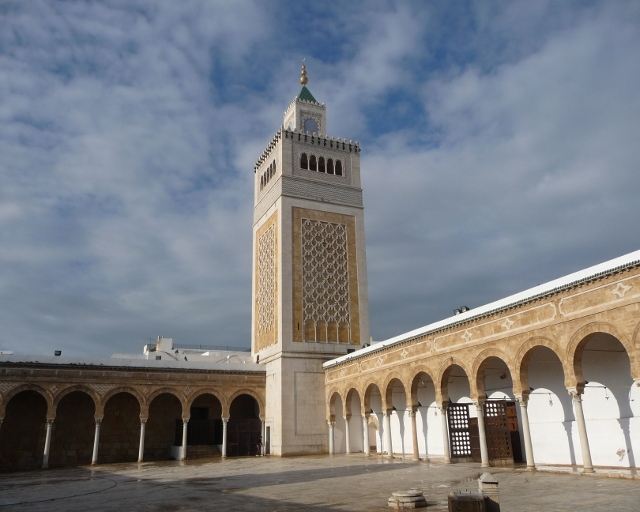 The only certain is that the Grand Mosque (known as the Zitouna – Olive Tree) is slap bang in the centre. 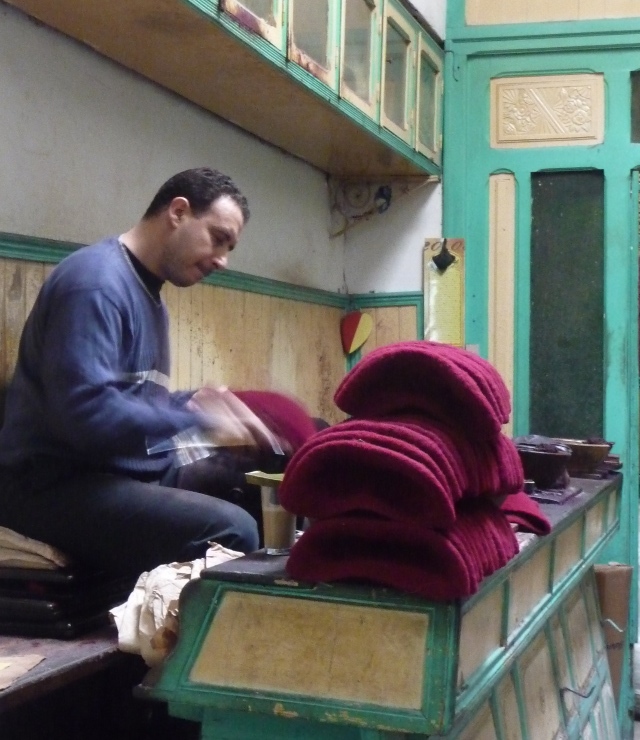 The Medina’s not just a touristy relic, either. Yes, there’s umpteen hundred shops and stalls selling two-foot tall cuddly camels and other similar hideous tat, of course – especially in the first few alleyways as you enter. But there’s still artisanal workshops with people hammering copper pots or making traditional red felt “checia” hats, in the same streets where people have made those exact same things for centuries. From behind anonymous doors, you’ll get the strong smell of wood glue and shavings, or hear sewing machines hard at work. There’s still plenty of plain everyday life going on – apart from the mosque, there’s streets full of clothing or general household object stalls. Sure, the contents have changed – there’s a surfeit of cheap plasticy trainers and Chinese-brand AA batteries, together with jackets with seemingly random English phrases printed on for slogans (My favourite was “Milky Step”. I jest not). 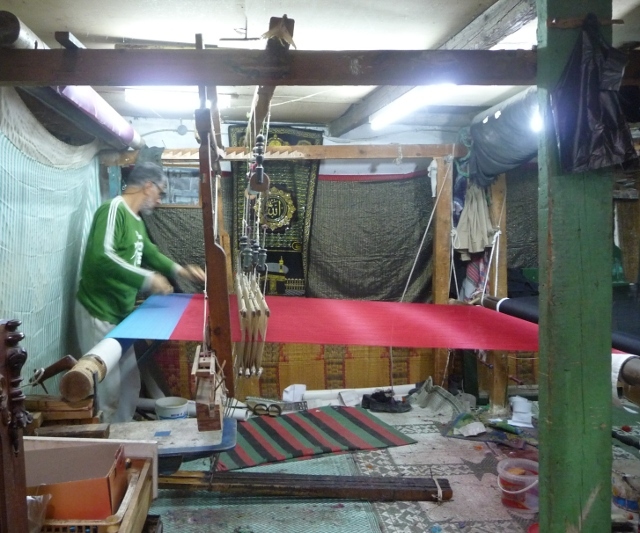 But this is where the general populace of central Tunis live and work and shop. And eat, of course. People fight through the mêlée with deliveries on sturdy handcarts, apparently doing intricate yet nonchalant little dancesteps to avoid all the housewives wandering around buying food from the markets – small reddy-gold “Rouget” fish crammed, tail first and head peering outwards, into plastic crates. 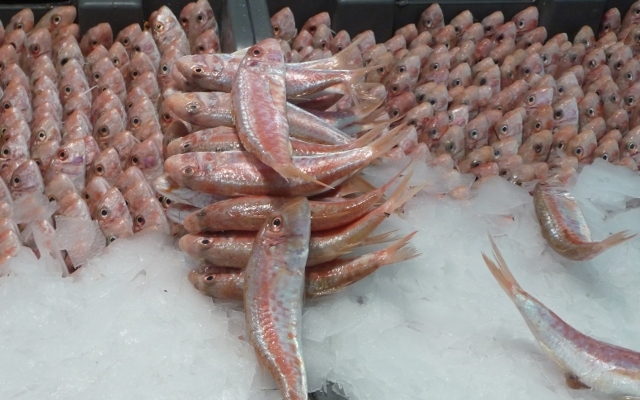 Larger fish and squid sit in neat rows or stacked attractively on the ice. Butchers shops with tripe hanging from hooks above head height, and the quality of the meat demonstrated by the head of the cow itself staring blankly out from pride of place on the wall. No distance between source and plate here. Vegetables piled high, some familiar, others alien. Then they’ll stop in at one of the cafes, a thick haze of smoke from the chicha water pipes obscuring the far side of the room, a small treacly-thick black coffee in front of everybody. Everywhere, the smell of burning charcoal – either a small stove busily stewing sweet tea outside a workshop or ready for the next chicha. If you didn’t want to stop in at a cafe, then stalls and hole-in-the-wall shops were piled high with sticky pastries. Handcarts were pushed around laden high with flatbreads, ready to be sliced and filled with spicy harissa, olives and preserved lemons and salad. Everybody’s so friendly – you’re obviously a tourist, and you’re assailed regularly by cheery greetings in French, then English or German. Most are genuine – they’re glad to see tourists here, especially since it’s the lowest of low season and the first anniversary of the revolution’s barely happened. Sure, some are touting – and it can be difficult to figure out which is which initially. You don’t want to be rude, but if you so much as return a “Bonjour!” from one of the touts, he’s walking with you trying to persuade you to visit the “Bey’s palace, with panoramic terrace and a handicraft exhibition closing today” (translation = a shop full of tat, with a low-rise view over the aircon units on the roofs – and that same handicraft exhibition seemed to close every day we were there)… But always with good cheer and a seeming genuine interest in more than just the contents of your wallet. We were walking around one of the less-trafficed parts of the medina, just aimlessly ambling in no particular direction, when an old boy greeted us. All the usual preliminary chat, and did we like? I think we’d been taking a photo of a gently dilapidated gorgeous old doorway at the time, so we were asked if we’d seen one of the most attractive, just around the corner – and an attempt to describe where resulted, of course, in us getting utterly mentally lost. No problem, he could show us. 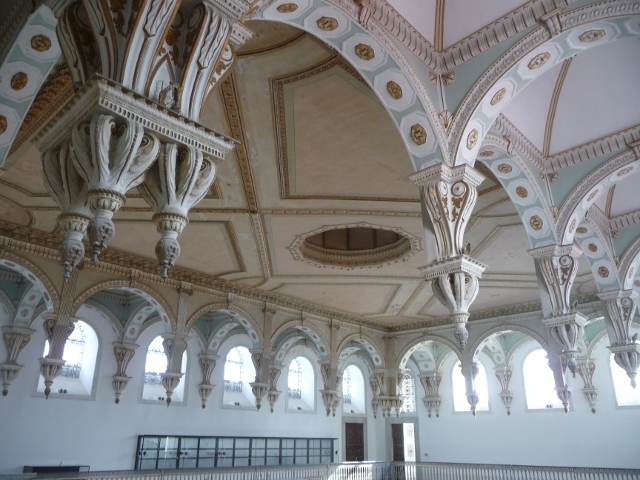 Then another, then a palace – all the hidden secrets. He’s not a guide, of course. Oh, no. He just loves the Medina, and his father showed him all the best-kept secrets when he was a boy. For an hour and a bit we wandered, into a silk-weaver’s and past a street full of small metalworkers, with people forgeing and hammering and welding and grinding out in the street, the air thick and smokey with a metallic tang. 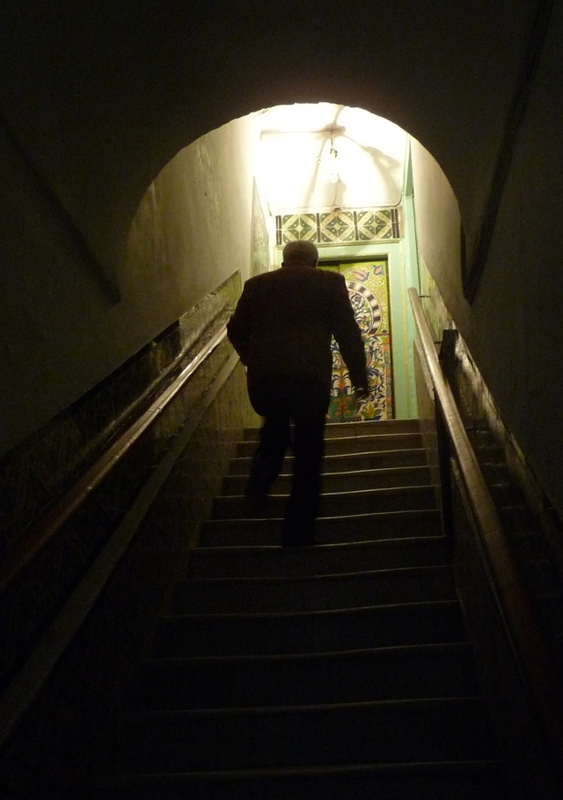 Opening and entering seemingly random doorways, climbing the stairs to show us doors or ceilings or tiled panels. Of course it wasn’t purely for the love of it, and a fee was expected and given. Not a small one, but not as large as the very generous sums he claimed others had given. A couple of days later, as we walked through other backstreets towards the old faubourg (or suburb) of Halfouine, we spotted another gorgeous old door left open – and, because of that tour, had the courage to just wander on in. It turned out to be the old palace which is now the headquarters of the Association de Sauvegarde de la Médina de Tunis, the group who are trying to keep the Medina as gorgeous as it is, and to try to arrest and reverse the decay of some of the buildings that’re more than just attractively crumbly round the edges. As we stared in awe at the entrance hall of the building, we spotted somebody in a small cubicle in one wall – and were gesticulated to come in and look around. Who were we to refuse? Down corridors, into more courtyards and rooms. All utterly gorgeous in their proportions, their light, their decor. 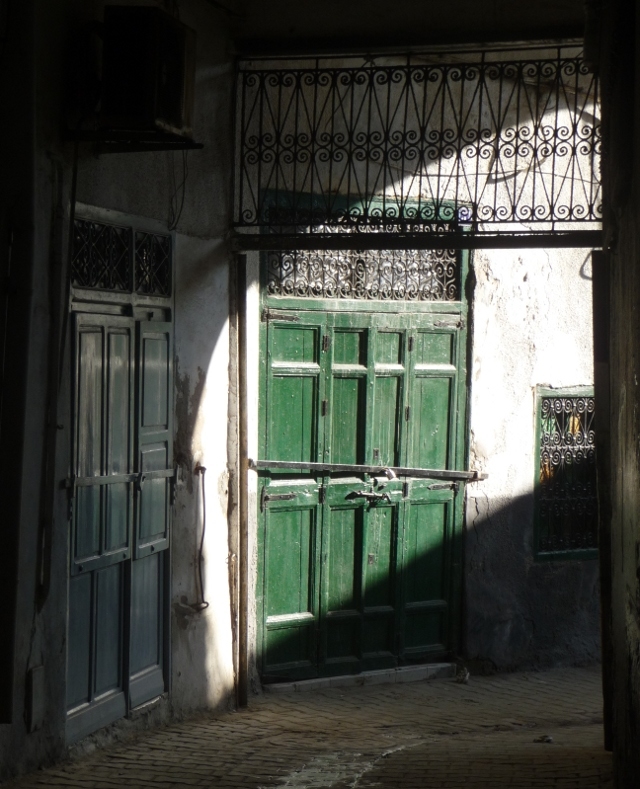 The streets immediately around that palace featured some of the few immaculately restored and “chic” accomodation and cafes we saw in the Medina – yet even they were cheek-by-jowl alongside scruffy cats rummaging through rubbish next to boarded-over doorways and peeling render. So when we reached Halfouine, one of the poorest yet liveliest areas of the old town, the contrast was merely one of shades. More open than the Medina itself, and with traffic-choked streets instead of the lack of any transport bigger than the odd bicycle, yet still with life teeming everywhere. More street markets. Kids pouring out of a primary school doorway towards their waiting parents – and even a sheep, with several small kids hugging its neck as it stood placidly. By contrast, the Bardo museum stands a tram-ride away in the Western colonial suburbs. Wide boulevards funnel several lanes of traffic along (albeit chaotically, of course) past large palm trees. The museum itself is just coming to the end of an extensive renovation and extension project – due to open fully in May, apparently. Which – as ever – meant that not very much was open when we visited. Typical. Still, what we did see made us want to go back. We saw relatively few of their apparently excellent collection of classical – Roman and Phoenician – statuary, but plenty of mosaics. Even underfoot, genuine two thousand year old mosaics. Our lingering doubts as to the motives of putative “helpers” saw us try to shy away from one chap who kept following us around and offering comments on the mosaics we were looking at. Yet it turned out that he was genuine – presumably, one of the museum staff, not overburdened with visitors. Because of the renovations, huge swathes of the museum were closed – yet he cheerfully moved barriers away from doors and swung them open for us to gaze into spectacular huge chambers with intricate ceilings – and all for no more than the pleasure of seeing our reactions and hearing our thanks. As we walked the streets around our hotel, right on the border between new town and Medina, we were briefly tempted by the line of minibus taxis – Louages – heading off to neighbouring Libya. Briefly. Very briefly. It really brings home how small the world actually is – we’re no further south than southern Sicily, only a few hours away by boat, yet we could just get in to one of these vans – perfectly normal-looking Mercedes or Toyota vans, even shiny and relatively unbattered – hand over a fare which would probably barely get you across a couple of London Underground zones and be in what we think of as a live war zone, one of our world’s longest and best-known pariah states, within a few hours and a few hundred kilometres. I have been reading of your adventures having found them fascinating.This was a particularily interesting one reminding me of when a mate and I went to Morroco in 1966. Keep up the great work I think you two should write a travel book.